Mutual success. In the modern b2b ecosystem, where competition and competitive positioning is fiercer than ever, mutual success between vendor and channel partner has become a withering concept. Partners regard deal registration as an essential tool that helps to eradicate channel conflict and solidify lead conversion. Vendors, on the other hand, utilize deal registration to stimulate partners’ sales and identify the end-customer. But that’s not all deal registration is capable of. 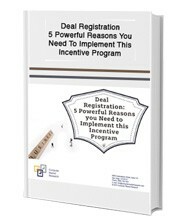 To find out more benefits of this lucrative incentive, fill out the form on the right to receive your Free copy of “Deal Registration: 5 Powerful Reasons You Need to Implement this Incentive Program”.